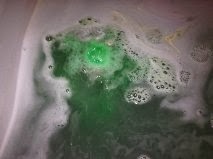 Tartan Fairytales : Lush Father Christmas Bath Ballistic Review! Hey guys! 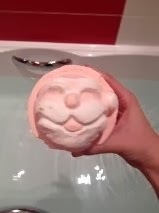 As I said in my last Lush bath bomb review I got loads of Lush goodies for Christmas so here is my review for the 'Father Christmas' Bath Ballistic. 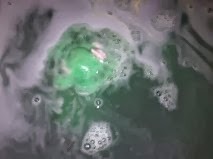 Now the description doesn't really go into detail about the scents and effects of the bath bomb but that just adds to the fun! Santa is getting thrown in at the deep end. 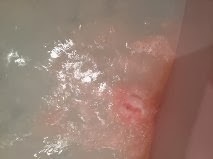 Now when I first dropped the bomb into the bath I was a little disappointed with how it all fizzed up. As I've said, I like it when they go, not with a fizzle but with a bang! (Classic Easy A quote there). I was greeted with the most gorgeous citrus-y scent and I wish I had loads of these bombs for the smell. Right then this became one of the best bombs I have ever used and I hadn't even got in the bath yet. 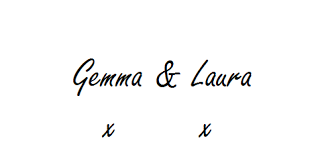 Then as I got cosy in the tub, BAM. The Father Christmas shell was removed to expose what I believe was a Christmas tree. I could however been wrong there. And I was unbelievably excited, sad I know. But I was so surprised by this little guy. Such a vibrant green colour that really contrasted with the pale pink. 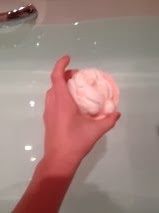 This bath bomb literally fizzed for more than five minutes. I was so amazed. It is a big bomb in comparison to others, however this one really lasted! To make it even better, my skin felt amazing after I used it. 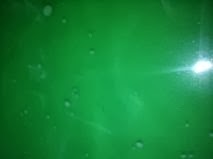 The amazing bright green colour of my bath water, I did not see that one coming! Overall, I am in love with this bomb and so far is has taken the lead in my favourite Christmas Bath Bombs. 10/10! Also guys, there is a little Christmas movie quote in this post! Let us know if you find it! Yeah that's the one!! Love the grinch!